The LS-324C is a midsize tripod from Leofoto’s portable “Ranger” line. It is bulky enough that I have categorized it as ‘All Purpose’, but this could easily be used as a travel tripod. It is lighter and more compact than many of the tripods I have characterized as such. This is largely a result of the design not including a center column, and having no provision for one. This is a recipe for success in my rankings, by shedding weight and boosting stiffness. As we will see, this makes the LS-324C one of the best value tripods I have tested. The first thing that we notice is the relatively low weight of the tripod. As said above, this makes the LS-324C an easy tripod to travel with. Unfortunately the height is on the short side as well. Most people won’t be able to get the camera to eye level. If you shoot using a tilting screen, this isn’t an issue. Otherwise, using this tripod will require some hunching over to look through the viewfinder. The design of the tripod precludes the use of a center column, so that can’t save the day here either. The leg angle of the LS-324C is 21.5 degrees. I consider 25 degrees to be ideal, and 22.5 to be the low end of the acceptable range. 21.5 degrees begins to make the tripod both less stiff and more prone to tipping over. The LS-324C tests well in stiffness despite the too narrow leg angle, which only begs us to ask “How good could this tripod have been?” Based on the stiffness vs leg angle research, I estimate that the answer is about 15% stiffer if it had been built with a 25 degree leg angle. Of course it would have been a couple inches shorter as well. Narrowing the leg angle is a way that manufacturers try to increase the height of the tripod without increasing the weight or bill of materials cost. Clearly I wish they didn’t. The LS-324C comes with a carrying case, a tool kit, a carabiner for hanging weight, and two sets of feet. The case is of perfectly acceptable quality. You certainly won’t feet the need to get a different one. It includes enough space to use with an appropriately sized head. 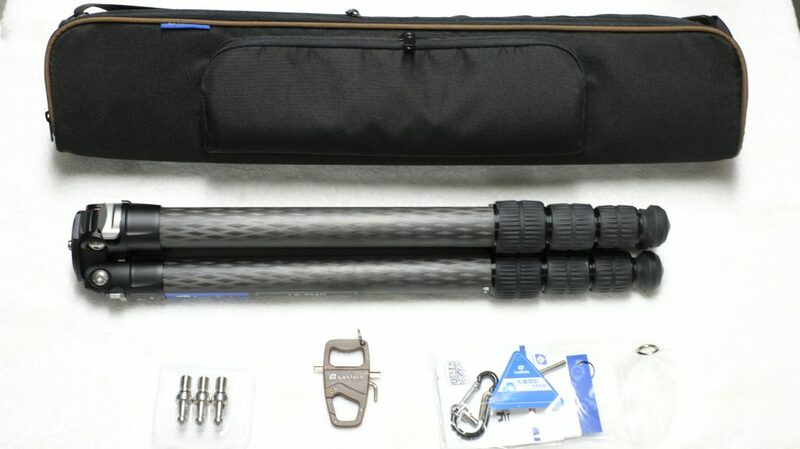 As it doesn’t usually make sense to use a carrying case for the tripod, this will provide a nice case for the tripod and accessories while they are in storage. One of the two included carabiners is a combination tool and bottle opener. Never seen that one before. Some sellers also include an attachable center column that screws onto the top of the tripod. If you need extra height from the LS-324C, this is the only way to do it. The use of such a center column is awkward though. The center column must be detached when the tripod is folded up for transport, which makes its use cumbersome. The center column also cannot be fully retracted, again, because it screws onto the top of the tripod. With the legs at full extension, adding the center column puts the camera above eye level for most people. The whole process and use is just awkward, and it is difficult to imagine many people actually using that center column in practice. If the center column is something you want though, make sure that it is included by whichever seller you are purchasing from. My particular copy of the LS-324C did not come with one.